MonthlyClubs.com recently added a new beer club to their lineup, called the HopHeads Club, also known as the IPA beer of the month club. I never really considered myself a “hop head”, but I do like IPAs! I wanted to check out this club to see how it compared to the other beer clubs that Monthly Clubs offers, so I purchased a two month subscription. Notes: Only club of this style! Hops can be controversial. A lot of my..in fact, most of my non craft-beer-drinking friends and family have pretty much sworn off hops. “I'll drink a blond or amber ale, but I can't do the hoppy ones.” By the way, these are usually the same guys that don't like stouts because they're “too dark”. OK, whatever man. 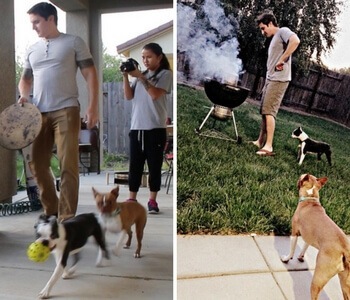 To each his own. The IPA beer of the month club falls somewhere in the middle of these two categories. So if you like hoppy beers, then this is a great beer of the month club to join. Honestly, I think it's my favorite beer club I've tried so far! Why? I appreciate all styles of craft beer. But for me, hops add something extra to taste and experience in a beer. You can have 100 pilsners, and they are all going to taste pretty much similar because there's a specific profile they need to match. Outside of that profile, and they border on experimental rather than pilsner. The same goes for a lot of styles. So basically, an IPA can be anything. Even with a simple category like a double IPA, you could have an amber colored, malty and chewy beer, or a light colored, dry and refreshing summer beer. It depends on who's making it, how they define the style, and how they label the bottle. Then, once you get into individual tastes, there's really no limit. People taste a range of fruits (mango, cherry, pineapple, stone fruit) and other things like blossom, pine, cut grass, pepper, and honey, which may or may not be in their head (lol). Anyway, the main point I want to make is that the IPA of the month club is going to deliver some diverse and delicious beers, despite being limited to just IPAs. Get $25 off your IPA membership here! In my first box, I got a blood orange IPA, and two other “normal” IPAs. I wish I had taken more photos of this first box so you could see the color differences, but I'll show more below. The blood orange IPA was my favorite, and it definitely had a fruity orange taste. Hop Hammer was my second favorite, since it was dry and crisp. I also liked Wild Ride, but it was a little maltier than the other two. Here is a very cool example of how IPAs have range. To the non-initiated, they are all just labeled “IPA”. However, these beers look and taste quite different. First off, the middle one, from Spencer, is a beer from the only Trappist brewer in the United States. I was very happy to get this beer because it seems like a rare pick, at least since I'm in California! It was Belgian style IPA, and I could taste the Belgian yeast flavors. Full Blast was a “summer ale”, so light and refreshing. Drier beers like this really bring out the bitterness in the hops, which I like. It's easier to taste the flavors! Bitter End from Fish Tale Hodgson obviously is a lot darker and maltier by comparison. A good beer too! 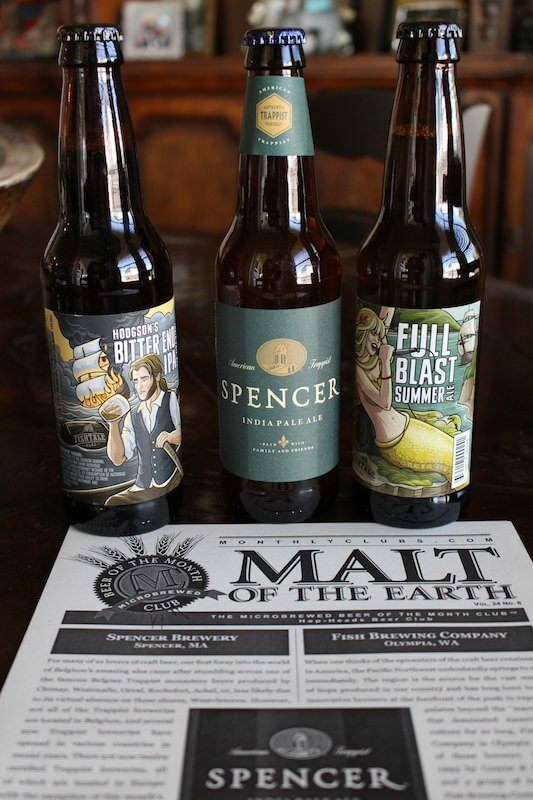 With each shipment of your beer club membership, you get 3 different beers from two breweries. Each type of beer has four bottles. This is different from other clubs like the Microbrewed Beer of the Month Club, where you would normally get 4 beers from two breweries, 3 beers each. Honestly, I'd prefer more variety, so I think they should bring in a second style IPA from the second brewery. However, I understand that the logistics of that might not work. Not all breweries have multiple styles of IPAs, especially when you are sourcing beers from around the entire USA, and not just from the West Coast (we are crazy for IPAs here). In your box, you also get the club newsletter, which is called “Malt of the Earth”. It talks about the breweries included in your package, as well as the individual beers. This is one reason why I usually prefer MonthlyClubs.com over other beer, cheese, and food clubs. This company includes a lot more educational material with their packages, which is part of the fun! That way you can read learn about the craft breweries and brewers, as well as learn about the beers you're drinking. Tasting and pairing notes can enhance your drinking experience! Maybe you just want good beer, and that's fine too. Another advantage of joining a club like this is that you get a variety of beers delivered to your door. If you live in a metropolitan city, you probably have access to lots of beers at your local bottle shop. But if you're a craft beer enthusiast, variety can run out real fast. Most stores stock what's popular, so they can make money. Understandable! I'm working hard comparing the best beer of the month clubs, and here's my breakdown of how the Hop Heads club compares. Personally, I think the main things to look at are going to be the type of beers delivered, and the cost. The cheapest beer of the month clubs are going to be around forty bucks a month. 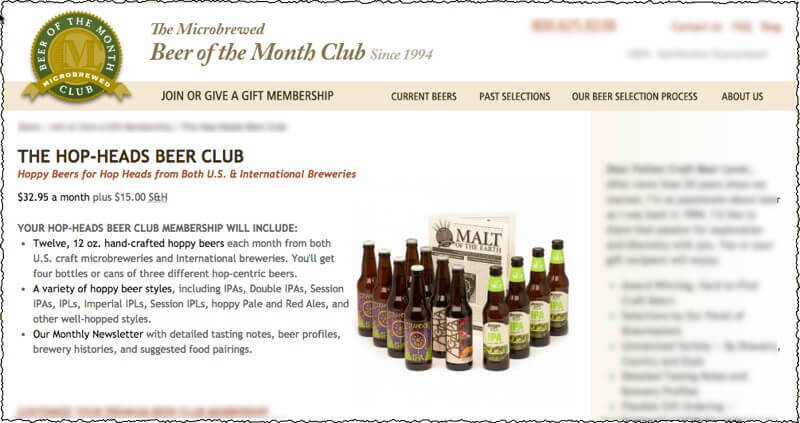 The Microbrew Club from Monthly Clubs.com is $42/month. The cheapest club I know is from AmazingClubs.com, but in my opinion the beer wasn't as good as what you get from Monthly Clubs. 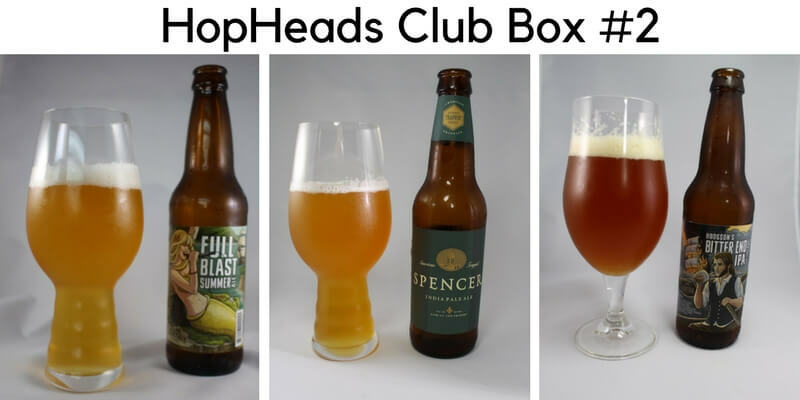 Including shipping, the Hop Heads club is $48/month ($32.95 a month plus $15.00 shipping). That breaks down to paying about $4 per beer, since you get 12 beers. S0, it's not the cheapest club out there. However, the premium you pay for hand-selected IPAs is only about $5 per month. Personally, I think $4 per beer delivered to your door is a little pricey, but fair. A six pack of decent beer is going to cost about $8-$10, or $1.50 per bottle. Compared to $4 per beer, it seems a bit expensive! But also consider that you get to try three types of beer, so you don't have to commit to a whole six pack. Also, the beer is delivered to your door, so you don't have to drive anywhere, and you don't have to spend time picking out the beer. Honestly, though I enjoy variety that other clubs offer, since you can get a vienna lager and a chocolate stout in the same pack, IPAs are probably my favorite style so I enjoyed the beer in the club more than any other club. Sure, I took photos and drank all the beers, but when it came to picking out a beer to drink off-camera, I always reached for something hoppy. The beers in all clubs were good, but the beers in the Hop Heads club were my favorite daily drinkers. Not into hoppy beers? You can get some special ones in the US/International beer club from the same company, or go with a regular beer of the month club from a different company like The Original Craft Beer Club or Clubs of America Beer Club. 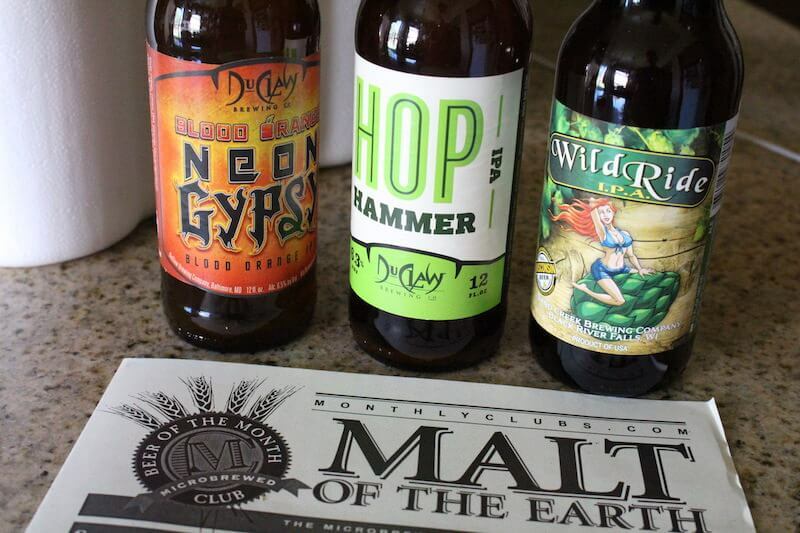 Overall, the IPA Beer of the Month Club was one of my favorite beer clubs. I'm just a hop head I guess. I found myself drinking these beers first above any of the other clubs I'm subscribed to. I drank them with dinner. I took them floating down the San Joaquin river. I didn't take them to my friends hours. So I guess that means they are my favorite! The only thing I think the club could improve would be to add more crazy IPAs like double IPAs, triple IPAs, brett IPAs, chocolate strawberry IPAs, and whatever else! The beers in the packs were delicious, but pretty tame. I think this will appeal to most beer drinkers though, as I tend to have eccentric tastes. Either way, it was well worth the money! ==> Sign Up For Monthly Clubs IPA of the Month Club!